There's something about sweet potatoes. Don't you love them? I do! Sweet potatoes are the healthy alternative to regular potatoes because they actually pack a punch of essential vitamins and minerals. They are anti-inflammatory and help balance blood sugar. The words 'yams' and 'sweet potatoes' are often interchangeable. They are actually two different vegetables, but are both great options. Staying clear of all whites is always best (white breads, flours, sugars, etc. ), but there is an exception... Japanese sweet potatoes. They are white-light yellow inside and have a purple skin. These are actually the most nutrient dense of all sweet potatoes. So enjoy your sweet potatoes/yams, especially the Japanese ones! Another day, another guilt-free chocolate creation. I was about to make some chocolate for an afternoon boost, and couldn't decide between a simple chocolate bar or raw brownies. Then I thought, I want both in one bite. So this happened. And it was heaven. Cacao has many health benefits. It is truly a superfood, but of course, when it's in its pure unrefined state and not when consumed in excess or with loads of refined sugar and dairy. So there you have it. Raw chocolate is simply good for you in right amounts. I'm going to be celebrating the weekend with this creation. I hope you do too. Place all ingredients in a food processor and process until well combined and mixture holds together when pressed with fingers. Line a small dish with parchment paper and press mixture down to form layer. Make sure to use a dish where you will cover all the surface, I used a 5 x 7 dish. Place in the refrigerator while you prepare the top layer. Mix melted coconut oil and cacao paste (melt ahead) or cacao powder. Place in a bowl and whisk in remaining ingredients. Pour over bottom layer and place back in the refrigerator until set, about 20-30 minutes. Cut into slices to serve. Store in the refrigerator. Summer in San Francisco is not really summer, but I still like to enjoy the amazing flavors and make summer treats like this smoothie and plum & coconut popsicles. 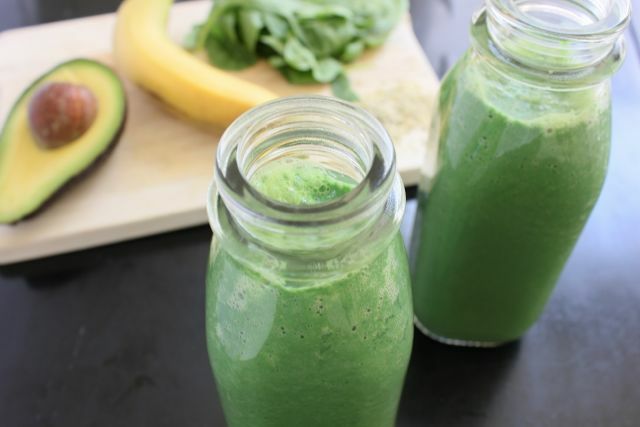 This mojito power protein smoothie is perfect for an afternoon boost or a well-balanced breakfast. It's packed with healthy fats, two of the best plant-based protein sources (spirulina, hemp seeds), and fresh greens that offer a wide spectrum of vitamins and minerals. Spirulina - Blue-green algea that grows in fresh water lakes all over the world and is truly a superfood. It is made up of about 60-70% plant protein, which makes it the world's highest source of protein. Spirulina supports blood sugar regulation, immunity, kidney function, skin issues, cholesterol levels, depression, and provides lasting energy. Hemp seeds - A complete protein, containing all essential amino acids. They have a perfect balance of protein, essential fats, enzymes, and vitamins. Hemp seeds are excellent for controlling blood sugar, reducing inflammation, improving circulation, muscle recovery, immune support, and providing sustained energy. Blend all ingredients together until smooth. Pour into fancy glasses and enjoy. There is lots of plum and coconut going on in my house these days. It's stone fruit season here in California and plums are just too good to pass up at the farmers market every week. This is a very simple recipe and perfect for an afternoon craving on a hot day. You can substitute any stone fruit for plums. Peaches would also taste amazing. Besides the great taste and vitamin benefits of plums, an added health benefit to this recipe is the maca powder. Maca is an adaptogenic root full of super powers. Adaptogenic means that it works to balance any system that is unstable/unbalanced in the body (nervous system, endocrine system, cardiovascular system, musculature). It also provides energy, enhances stamina and libido, increases endurance and strength, boosts mood, and balances hormones (aids with PMS). It has a nutty and delicious flavor. Make sure to purchase a raw and organic maca powder to get the full benefits and added chemicals. Make plum layer: blend all ingredients until smooth. Pour into popsicle molds and place in freezer for 10-15 minutes for it to begin setting before you pour the next layer. Make coconut-maca layer: Blend all ingredients until smooth. Once plum layer has nearly set, pour coconut mixture over it to fill molds. Place in freezer for another 15 minutes. Insert popsicle sticks and return to freezer until fully frozen. To take out popsicles, run molds under cold water for about 10 seconds. Enjoy! For another delicious plum recipe, check out my previous treat: coconut-lavender pie with plum sauce. Tell me, what's your favorite stone fruit? I don't have much else to say about this recipe other than encourage you to run to your farmers market to buy some fresh organic figs.